The identification of new industrial yeast strains is based on the capacity to generate a sufficient genetic diversity in a cells population that can be then screened for traits of interest. The main mechanism that creates such diversity is the homologous recombination that takes place in the meiotic phase during gametes formation. Unfortunately, many industrial yeast strains have difficulties to perform meiotic recombination efficiently (e.g. spores sterility) leading to a poor genetic diversity for these strains. 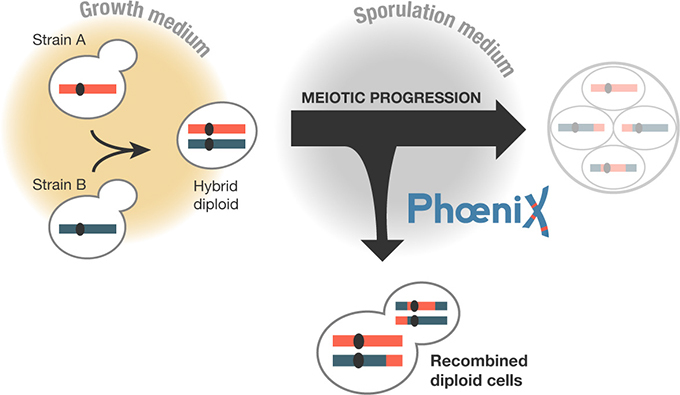 PhoeniX is a non-GM method that efficiently induces meiotic recombination in hybrid diploid (or polyploid) yeast cells without the need to go through the entire process of meiosis. PhoeniX relies on the capacity of a yeast cell to switch from meiosis to mitosis upon certain triggers (return-to-grow or RTG) and leads to highly diverse recombination profiles. We have developed a proprietary bioinformatics pipeline to analyze NGS datasets of the selected recombinant PhoeniX cells and facilitate the identification of quantitative-trait-loci (QTL). We are currently applying PhoeniX to different yeast strains and we established collaborations (e.g. Lesaffre International) to develop novel and more performing yeast strains.